A report has found that adding a loft conversion can add more than £42,000, or about 22%, to the value of an average property. The Nationwide’s chief economist, Robert Gardner, said that homeowners were prepared to pay extra for more usable space and that this was often associated with accommodation of a better quality. Location is a main factor in house values but other factors also play an important role. Where there are home improvements which increase the floor area, such as loft conversions and extensions, this remains a good way to increase the value of the home. If you are considering a Loft Conversion in Weymouth, call World of Lofts today. A loft conversion can be simple or complex. It is possible to add a loft conversion without applying for planning permission under the Government permitted development rights criteria. However, if you are altering or extending the roof different rules apply and you will need to seek planning permission. Your local loft conversion specialist in Bournemouth will be able to handle all the necessary applications and building regulations that are required so that you can relax and look forward to enjoying the newly created space that will be available once the work is complete. When transforming your loft consider the use of daylight in your design, otherwise known as “daylighting”, the aim is to incorporate as much natural light into a space to illuminate the interiors of a building. There are many articles which suggest huge health benefits to the use of natural light. It has been proven that the addition of daylight in a room can boost mood, enhance morale, reduce eye strain and improve general mental health as well as providing vitamin D to the body. There are a number of options available to provide natural light depending on the size of the space; from light tunnels and skylights to roof windows, all provided by Velux Windows. For a free design and quotation for your Loft conversion in Weymouth, contact World of Lofts. The UK housing market is still difficult with a lack of choice available to would be purchasers. New homes are full of features but often have small rooms, especially bedrooms. One way to overcome this is to consider a loft extension to add much needed extra space, whether it is a bedroom or an office. Firstly you need to find out if your roof space is suitable for a loft conversion and you will ideally need to contact a specialist loft conversion company who can create a bespoke loft conversion in Winchester. Contact us at World of Lofts in Dorset, and we will be able to give a guide to the cost and tell you whether it is feasible to convert your roof space. Research carried out in the US by the US Census Bureau has found that 20% of America’s population live in households occupied by several generations of one family, generally including grandparents and grandchildren. One of the reasons put forward for this is the cost of accommodation, the cost of child care or the cost of caring for a parent or family member with health needs. To meet this demand builders are converting properties to include extra living space in the roof or rearranging the accommodation to include an extra bathroom or kitchen. As these same pressures apply to UK homeowners and the added uncertainty of the current political situation there has never been a better time to consider a loft conversion to add extra space to your home. 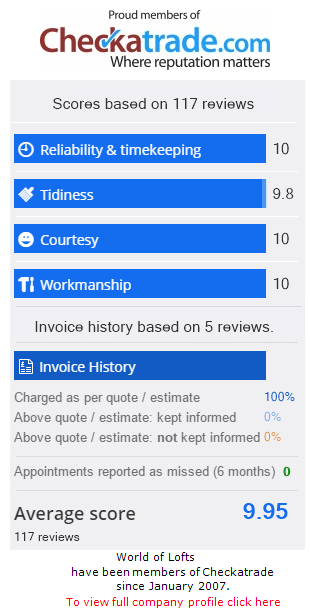 For a loft conversion in Bournemouth, World of Lofts are a specialist company with a first class reputation and an excellent Checkatrade score. One of the advantages of a loft conversion is the additional light that will flood into your home. Developments in the range of Velux windows mean that there is a window available that will enhance and fit any type of room or situation. The latest innovation is a range of white painted Velux roof windows. The windows are still constructed in the traditional way using high quality wood but are painted with superior quality UV resistant, water based breathable paint. The clean white finish reflects the available light back into the room making it even more light and airy. Another option is to have sloping and vertical windows fitted which will greatly expand your view. Where practical it is possible to even extend the living space further on to a roof terrace accessed via your Velux windows. Modern design and innovation has unleashed endless possibilities for new or updated loft conversions, the only limit is your imagination and your budget.Call 01202 761199 for more information on Velux windows in your Bournemouth Loft conversion. The average house price in the Bournemouth area is now around £283,000 and of the 3000+ homes for sale only 16% have 4 bedrooms and 22% have 3 bedrooms. Similar figures apply in the Poole and Ringwood areas. A recent report compiled by Post Office Money and the Centre for Economics and Business Research found that the average cost of moving home in the UK has now reached £12,000, an increase of 59% over the last 10 years, plus most people take on bigger mortgages in order to increase the size of their accommodation. An average loft conversion in Bournemouth would cost around £17495 and add between £20,000 - £30,000 value to your home, give you extra space, save you the heartache and stress of looking for a suitable new home, and you won’t have the hassle of packing everything up, changing schools, doctors surgeries, letting everyone know you’re moving etc. etc. Free home visit and quotations for Loft Conversions in Ringwood and throughout Dorset. Underestimating the importance of natural daylight in your home can be a big mistake. It affects the way we feel, think and operate. Some people are more sensitive than others, but imagine spending your days in a room with no windows and only artificial light and consider the impact that might have on your sense of wellbeing. When you are planning your loft conversion in Ringwood or Dorset, make sure you add enough roof windows into your plans. Not only will the light enhance the room it will filter down into the rest of your home and improve all your living space. If your new room is to be a bedroom waking up to a room filled with natural light will set you up for the day and put in the right frame of mind to enjoy the day ahead. Natural light in an office environment can reduce eyestrain, give you a sense of space and just make you feel more connected to the outdoors. Studies have shown it to increase productivity and creativity and will help to keep and clear and focussed mind. Wall colours have an immense effect on the light within a home. In the northern hemisphere, daylight already has a lot of blue in it, so, to avoid a space that seems cool, warm colours, even a warm white, will create a better feel. Lighter ceilings always create an illusion of height, space and brightness. The British government recently reassessed the handling of planning permission and funding. Specifically this concerns Section 106 and provides many benefits to small building developments. Brandon Lewis, Minister of Planning, stated that for projects with 10 sites or less will be exempt from certain contributions. Mr Lewis made the following comments: “The supply of housing will see increased as associated costs for construction are reduced. This will affect bothcurrent home renovations and new builds. Brownfield site constructions will be helpedto grow, creating greater variation in the housing sector. Additionally this will provide a much needed boost for small-medium scale developers. The Builder’s Finance Fund has been bolstered with £525m from the government. This will provide essential support for many struggling small developments and construction schemes.As a result a positive influence will be seen around the country including renovations and loft conversions in Poole. A spokesman for the Home Builder’s Federation (HBF)expressed the following: “This relaxation will offer a much needed lifeline to small scale developments. Section 106 has been a nightmare many smaller developments, thehurdles will consume both time and funding. This has been highly detrimental to the growth of numerous projects, stopping some dead in their tracks. Brain Berry, chief executive for the Federation of Master Builders (FMB), said: “Using a 10 units or less bracket for contributions is a reasonable solution which should reduce pressures on costs effective housing. Previously, many house builders have not been able to gain traction in the market, but this will provide more opportunity. This is becoming especially important as an ever increasing number of new houses are required to prevent a crisis in the future. “Thanks to the government the low level home builders can gain access to the much needed financial fund. Hopefully we can look forward to seeing real positive changes across the industry as a result. It is also encouraging to see that the government has listened to advice and considered the options carefully. A recent study has shown that adding a loft Conversion can boost the value of a property by over 20 per cent, by making an attic room, has the potential to add £37,000 to the value of a home, while adding just one extra bedroom can add an extra £20,000, according to research by the Nationwide Building Society. The figures are based on the average house price currently £178,124 according to Nationwide’s price index, meaning an extra bathroom could add £8,900 to the value of a home. We offer a personal high quality service with each project carefully overseen by our qualified engineer; we only use experienced Tradesmen, who are all specialists in their own fields, from architects to electricians, so we can provide all our customers with an unrivalled finish to their Loft Conversion. All our Loft Conversions are undertaken to our clients’ specific requirements, to ensure you gain the most relevant living space from your loft space. Many Estate agents agree that a Loft Conversion, which has been professionally designed and built, will add value to your home, in terms of both value and sales potential.